When newspaper headlines about Wright’s affair with Mamah Borthwick Cheney drove him from Chicago in 1911, he returned to the comfort of a place he had spent much of his childhood. Originally settled by his maternal family, Wright had spent several summers farming the land that he purchased for Taliesin. His love for the setting can be felt in the home he created, which would serve him for the rest of his life. Following family custom, he gave the site a Welsh name, “Taliesin” (pronounced Tally-ESS-in), which means “shining brow.” The name symbolized Wright’s intention to create a home that was “of the hill,” not on it. Taliesin was therefore built below the hillcrest, on its brow rather than its crown. Regarded as one of Wright’s most significant expressions of Prairie-style organic architecture, the house uses local materials to echo the expansiveness of the Wisconsin landscape with a layout that the architect described as “low, wide, and snug.” Local farmers helped Wright move stone from the yellow limestone quarry nearby, which he then mixed with sand from the river to create Taliesin’s walls. Plaster for the interior walls was mixed with sienna, providing a golden hue reflective of the pastoral setting. 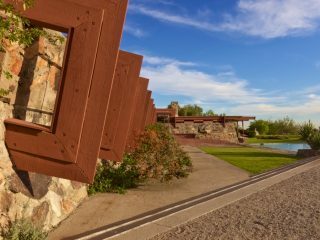 Taliesin features many architectural elements that became Wright’s trademarks: the cantilever roofs, wide windows and an open floor plan. Wright would rebuild the house twice, following significant fire damage in 1914 and 1925. The property grew and expanded overtime, with buildings to house its various functions as a home, a studio, a school of architecture, and a self-sufficient working farm. Taliesin, like all the homes that Wright designed for himself, continued to evolve over the nearly five decades that he lived there. Wright treated the home as a laboratory of sorts, continually altering it with the help of his apprentices whom he called “the fingers of my hand.” Though Taliesin would remain his home until the end of his life, beginning in 1937 Wright and the Taliesin Fellowship would migrate to Arizona’s Taliesin West each winter. 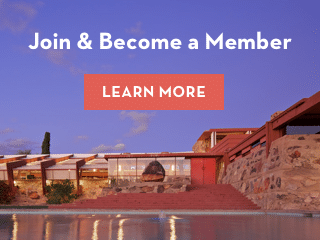 Upon Wright’s death in 1959, ownership of the Taliesin estate, as well as Taliesin West, passed to the foundation that Wright had established in 1940 to preserve his legacy. 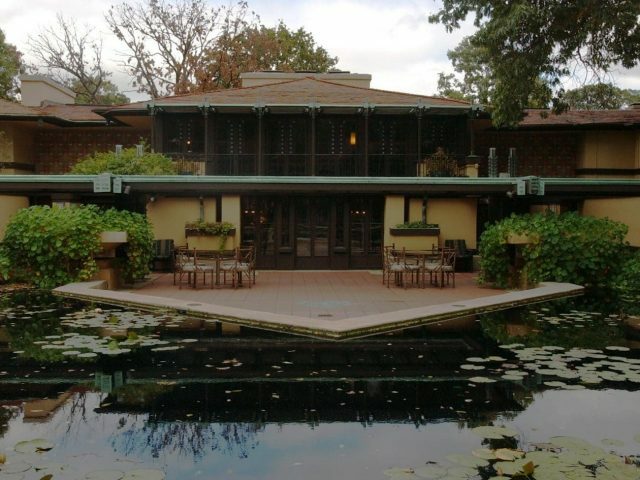 Today, Taliesin remains the active home of the Frank Lloyd Wright School of Architecture from May-October. The site’s upkeep continues to be part of the education of the apprentices and is now also attended to by the Taliesin Preservation, a non-profit established in 1991 to steward the preservation and legacy of the complex.